Last weekend was my second year running the Whistler Half Marathon and once again proved to be an excellent weekend away. In fact my over-riding impression of the weekend is that it really was so much more than just a 21.1km race. it started the moment we drove into town on Friday afternoon. Whistler is such a great vacation-atmosphere resort town so I really enjoy the vibe and kickin' back. After our 7 hour drive I really do feel like I'm in vacation mode!! We wasted no time checking in to the host hotel, visiting package pick-up downstairs and then heading out for a late lunch. The village stroll is full of options; we took advantge of the gorgeous weather and ended up on the patio at La Bocca - a place right opposite our hotel! Later that evening we also attended the presentation and pasta party at the local Brewhouse. It was difficult not to sample too many of their craft beers, but race day in Whistler is Saturday!! We stayed at the Crystal Lodge - the same hotel as last year and I really can't recommend it enough. It is so nice to be walking distance to the start line. With my usual race morning jitters and angst about last minute pit stops I can skip the porta potty lines and with minutes to spare leave my cosy hotel room and jog down to the start line and hop stright into the corral as the national anthem is playing! Sa-weet! My race wasn't my best result. Last year I broke a huge barrier for me and clocked my first sub-2 hour Half Marathon - I then managed to finish all 4 of my 2013 halfs in under 2 hours. My race on Saturday I came in a little over 2 hours - of course I'm over 40 now! - yes, indeed, that must be it!! When trying to look for silver linings I can say that I conquered Blueberry Hill. A rather infamous hill near the start of the race - it stretches a little over 1km and I remember last year walking a good portion of it. This year I reached the top without stopping and felt pretty darn pleased with myself. 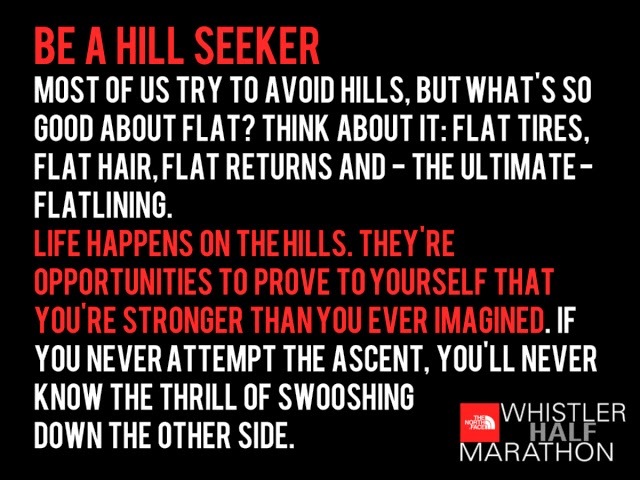 But there was a lot of unexpected hills - a lot more than I'd remembered and Blueberry Hill I think had so physched me out I gave everything I had to that and left nothing for later! I was dragging from around the 12km point - yikes - it was a still a long way to go. Anyway, I finished. 2:01:51. Surprisngly one of the highlights of my weekend was a late addition to the Race weekend schedule - a 'RecoverRun' on the Sunday morning. Given that it was an 8am start and I was giving up any chance of a weekend lie-in I signed us up for this free bonus event. It was a coach-led 5km trail run around some of the fabulous Lost Lake cross country trails right by the village. Aside from the fact I was taken somewhere I'd never been before it was a comfortable paced 35 minute run with a stretch routine after in The North Face store. There were just 50 spots available so it was a great sized group and perfect opportunity to loosen off those weary legs! We all received a North Face visor for showing up and had coffee, fruit and chocolates to welcome us back after we were done! And we were up, worked out and back in our room with plenty of time to shower, chill out a little and grab breakfast all before our check-out time! 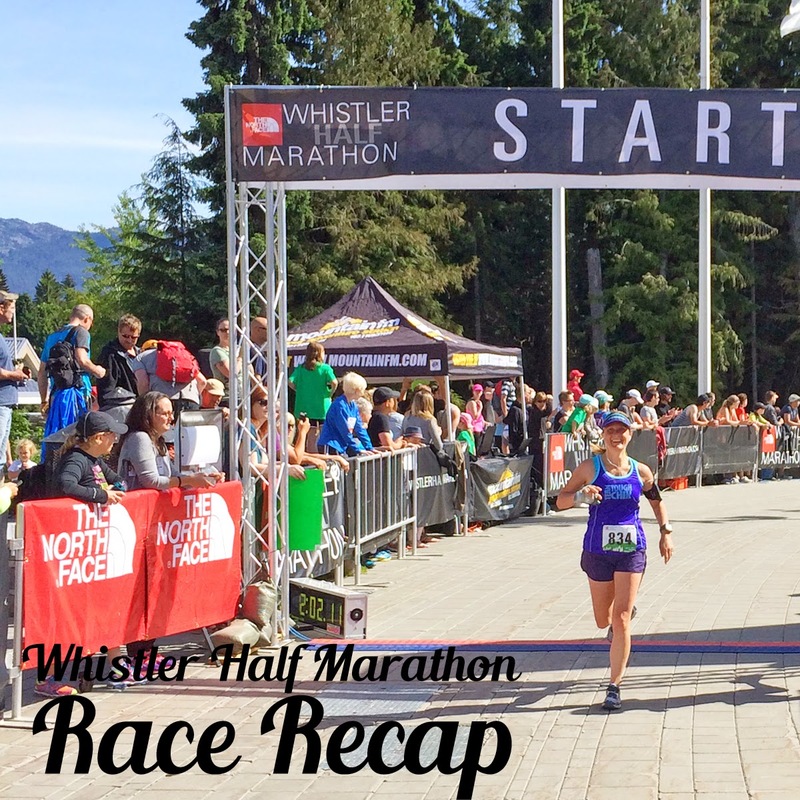 The Whistler Half marathon sells out quickly and it's really no surprise why! It's a great deal - I think the early bird rate was just $78 (with no annoying fees and taxes) and our race packages were full of goodies - it's heavily sponsored by The North Face and they look after us well - a cute women's cut tshirt, arm warmers (whcih I saw in the store later retailing at $28! ), a water bottle and the visor which I got at the Recover run. Plus awesome food and special 'North Face' toasted cheese as post-race food!! (yes the logo is imprinted onto the toast! ), Refresher drinks from Starbucks and Oikos Greek yogurts from Danone. Another fabulous weekend in the books! 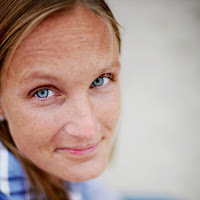 I'm linking up to Jill's Fitness Friday! 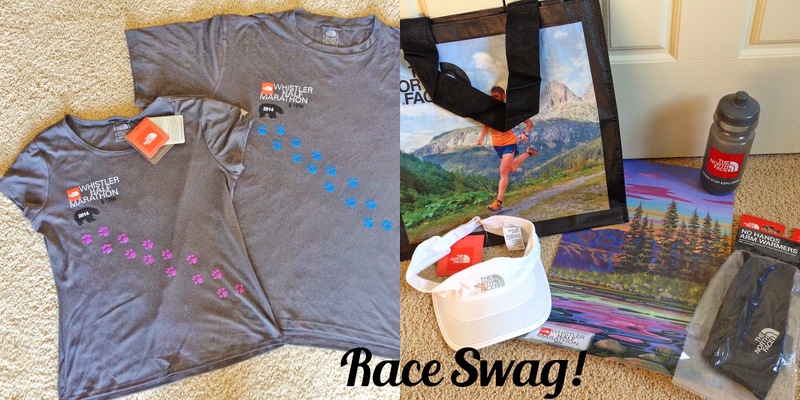 Great race report and very nice time! I would love to run a North Face race in the future. Especially for the North Face branded toast - that's crazy!